Jesse Edwards joined the All Souls staff in the fall of 2013. Jesse is the sound technician for our Sunday morning services, managing our sound board, microphones, and assistive listening devices. 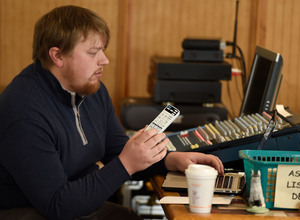 He is a recent graduate from Connecticut College majoring in film studies and is a local musician who performs regularly at the Mystic Seaport. He can also be found helping out with sound for our Friday Night Folk concerts.